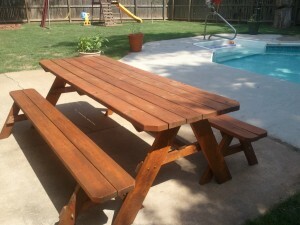 Adam's Fence Company :: Custom Picnic Tables! Home Tips Uncategorized Custom Picnic Tables! I’ve been building custom Picnic Tables along with fences. The Tables can be made to your length and width specifications as well as with movable or attached benches. The one in the picture here will seat 8 comfortably! Let me know if there’s any interest out there!